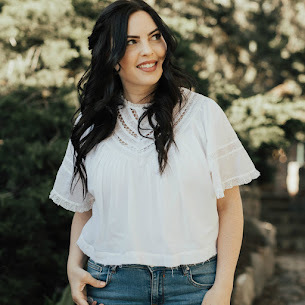 Janelle In Real Life: dressed up and funday monday link up! dressed up and funday monday link up! Hey friends. Here's a little dressed up style for you! It's what I wore to church a week ago (since yesterday we got to watch church on tv in our pj's). 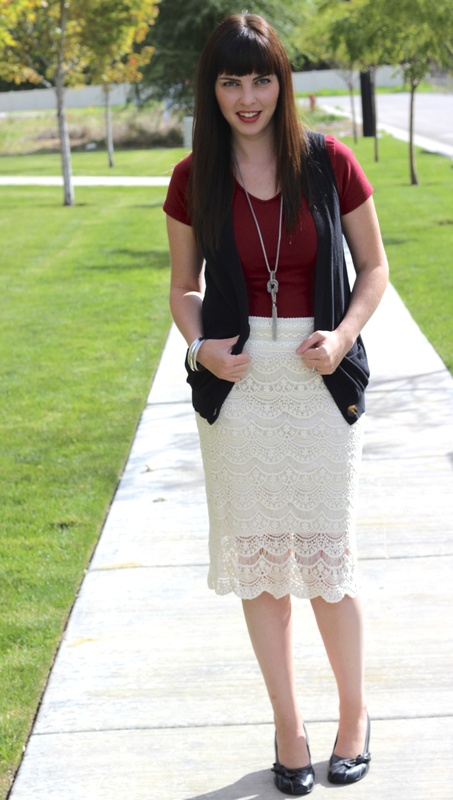 I've been obsessed with the crochet style skirts and I found this perfect one a few months ago! Sometimes I'm picky about choosing the right things for my closet and I shop around FOREVER to find just what I want (and by then it's practically out of style). Anyway, love those good finds. You know what else I love? Link ups! So here's a fab one for you. 1. Follow your hosts Molly @ still being [molly] , Carly @ Lipgloss & Crayons , and your guest hosts for the week Janelle from Janelle in Real Life and Cindy from My Style Spot. 2.Grab a button and / or post a link back here in your BLOG POST (NOT your blog’s main page) so your readers know what all the #fundaymonday-ness is about. We love you guys linking up and we do go through and read all your posts… so if you do not give credit, we will have to remove your link. That’s no fun, right? Right. So be nice and share a link! Pretty please? 3. Link your blog post up using the linky tool below! It can be ANYTHING! 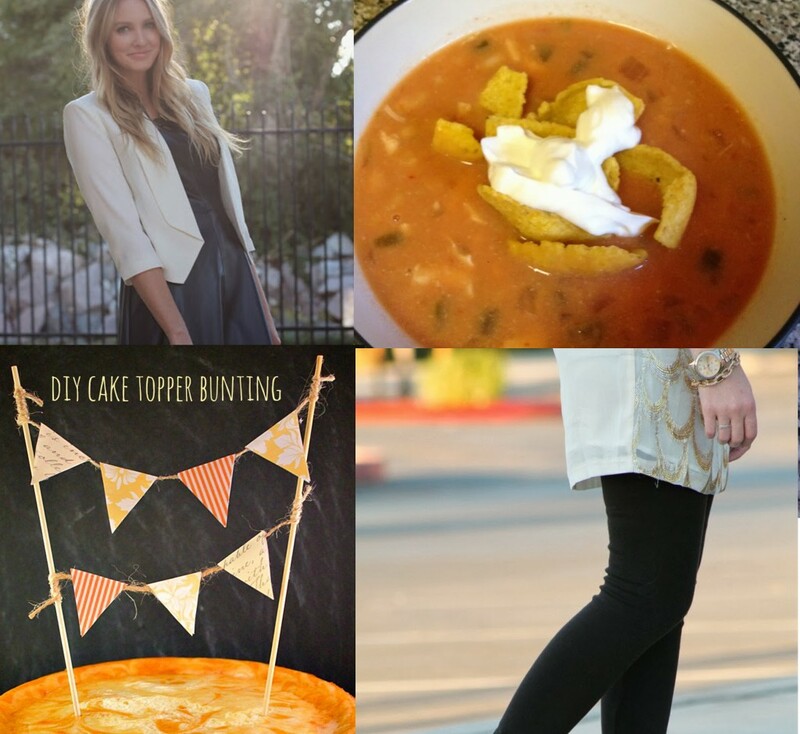 An outfit post, a giveaway, a story, a recipe, whatever. Why? Cause it’s #fundaymonday! 4. Visit a blog or four that you’ve never been to before and leave a #fundaymonday comment – you never know, you might “meet” someone new that you will lurve! 5. Have fun! Cause it's Monday! Great outfit. 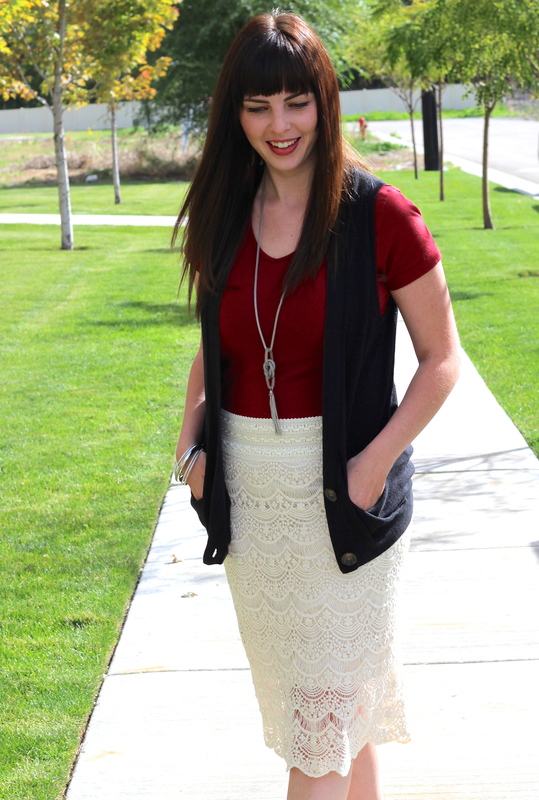 Love the vest styled over that pretty top and skirt. very pretty. I love the lacy skirt---sometimes finding just the RIGHT one takes time but the payoff is HUGE!! =D The necklace is really pretty too. That skirt is gorgeous! And I love the tassel necklace.. I need something like that! Thanks girl! I just got the necklace from h&m recently and I can't stop wearing it! That skirt is fantastic! I love it so much. Great outfit! I like how the vest looks with your pretty skirt. LOVE your skirt! So pretty! I do me some general conference weekend! Perfect excuse to wear pj's all day. Thanks so much for following! That skirt is adorable! Love the whole outfit! That skirt is lovely! Sometimes I take a really long time to find the precisely perfect item, too. I consider it a good trait because then I don't have a whole bunch of stuff I sort-of like in my closet! Thanks for co-hosting Funday Monday - I look forward to following you. It is a beautiful skirt!